Nírnaeth Arnoediad (472 Y.S.) 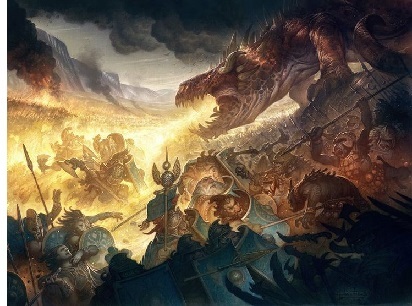 - "The Battle of Unnumbered Tears", the fifth and final battle for the dominion of Beleriand. Morgoth had been assaulting the Noldor relentlessly, and the Elves were on the verge of defeat. In a desperate attempt to turn the tide, Maedhros, eldest son of Fëanor, tried to build a coalition of Elves, Dwarves and Men to attack Angband and permanently criple the Dark Lord's ability to wage war. The coalition was called the Union of Maedhros. The Dwarves and Men joined, and the children of Fëanor and Fingolfin participarted as well. But Thingol, because of his age-old emnity toward the House of Fëanor (not to mention the fact that he had a Silmaril that they wanted back), refused to send an army. And Nargothrond, which belonged to the House of Finarfin, sent only a small contingent led by Gwindor. 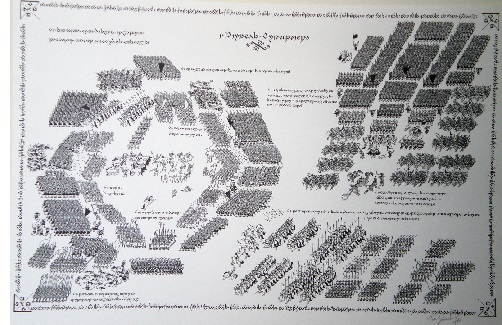 However, King Turgon of Gondolin brought forth and Elven army of 10,000 to bolster the force. 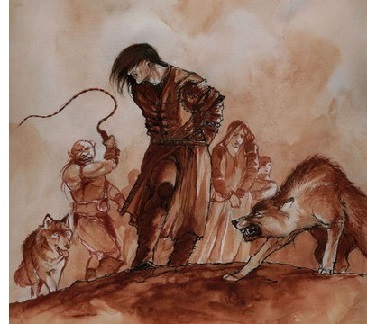 "At length Maedhros, having gathered all the strength that he could of Elves and Men and Dwarves, resolved to assault Angband from east and west; and he purposed to march with banners displayed in open force over Anfauglith. But when he had drawn forth, as he hoped, the armies of Morgoth in answer, then Fingon should issue forth from the passes of Hithlum; and thus they thought to take the might of Morgoth as between anvil and hammer, and break it to pieces. "On the appointed day, on the morning of Midsummer, the trumpets of the Eldar greeted the rising of the sun; and in the east was raised the standard of the sons of Fëanor, and in the west the standard of Fingon, High King of the Noldor. Then Fingon looked out from the walls of Ethel Sirion, and his host was arrayed in the valleys and the woods upon the east of Ered Wethrin, well hid from the eyes of the Enemy; but he knew that it was very great. For there all the Noldor of Hithlum were assembled, together with Elves of the Falas and Gwindor's company from Nargothrond, and he had great strength of Men: upon the right were the host of Dor-lómin and all the valour of Húrin and Huor his brother, and to them had come Haldir of Brethil with many men of the woods. The Noldor thought everything was going to plan, but what they didn't realize is that Morgoth grew wise to their plan through his spies, and sought to disrupt it. "The Captain of Morgoth in the west had been commanded to draw out Fingon swiftly from the hills by whatever means he could. He marched on therefore until the front of the battle was drawn up before the stream of Sirion, from the walls of the fortress of Ethel Sirion to the inflowing of Rivil at the Fen of Serech; and the outposts of Fingon could see the eyes of their enemies...Then the Captain of Morgoth sent out riders with tokens of parley, and they rode up before the outworks of the Barad Eithel. With them they brought Gelmir son of Guilin, that lord of Nargothrond whom they had captured in the Bragollach; and they had blinded him. Then the heralds of Angband showed him forth, crying: 'We have many more such at home, but you must make haste if you would find them, for we shall deal with them all when we return even so.' And they hewed off his hands and feet, and his head last, within sight of the Elves, and left him. 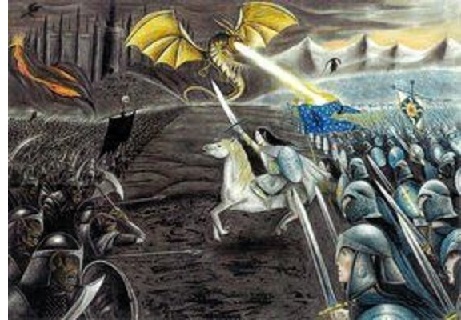 In this manner, Morgoth was able to make Fingon's wing attack before the full force of the alliance arrived. Even so, the ferocity of the charge caught the Enemy off-guard. For four days the battle raged, but the alliance could advance no further and at last had to withdraw. The retreat turned into a route for Morgoth. His army pursued and slew many, including Haldiir, lord of the Haladin, along with most of the Men of Brethil. They were able to meet up and push back the enemy. And then suddenly, hope for victory was renewed when the third Elven host arrived. But unbeknownst to the alliance, Morgoth was holding his greatest force in reserve. Even with this new enemy on the battlefield, defeat of the alliance was not yet assured. There was one race which stood firm against the dragons. Meanwhile, back in the Elven camp, another drama was playing out between the High King of the Noldor and the killer of a former High King of the Noldor. And thus the battle was ended in victory for Morgoth. The final insult came when Húrin was taken alive and dragged back to Angband by Gothmog. There Morgoth kept him imprisoned for 28 years.